What’s a Christian’s Relationship to be to Earthly Government? Listen for these questions and answers for “Put Not Your Trust in Princes – (the Election)”, below in the 1-part Video , or the one-part MP3 Audio Sermon. Have you ever felt that you are not sure that God is with you, even though you desperately need Him? Have you ever asked the question, does God really exist? What proof do with have, aside from “direct revelation” that we do have a God, the intelligent designer of life, that he does truly exist? Is God always with me? Us? Can we be sure, that God is close to us, even in the terrible times? Is God near to everyone on earth? How do we get to be near to Him? Who is God near to? Can God ever depart/withdraw from a believer? But what if I don’t feel Him, don’t see Him, been in affliction a long time, in great distress, and He has not come to save me – is He with me even then, Pastor? Have I sinned in some way and He is far off? Where do we look when all our senses fail us? Listen for these questions and answers about Is God Still With Me Even In Bad Times ?, below in the 1-part Video , or the one-part MP3 Audio Sermon. Questions answered in the Sermon: In John 6, Jesus feeds 5000 people on the hill from just five barley loaves of bread and two fish. What is so significant and important, just before that miracle? What do you think Jesus is teaching us about this thanks that he gave? Why is it important for us to give thanks to God-even in the midst of a seemingly impossible situation like that one, even when God has not yet done something for us, to save us? How does giving thanks change our circumstances? Why is it the right thing for us to do? And what does giving thanks have to do with God stirring up His power to come and save us? How does giving thanks to God change the things inside of us? How does giving thanks change things outside us? Listen for these questions and answers about How Can Thanksgiving Set Me Free ?, below in the 1-part Video , or the one-part MP3 Audio Sermon. Will God also indeed provide for you in all things you need in this life? And how about especially in those situations that you deem impossible – a financial crisis, a health crisis, a ministry crisis, a spiritual crisis? Will He provide for you at that time as well? And will He provide for you a salvation and a future and a home in his kingdom? And will you trust Him to do all these things for you? Does God try to test our hearts with overwhelming situations? How can we use and learn from these tests? Does this mean that whenever we face a crisis that we should sit back and do nothing, and wait for God to save you? Why can we trust Him always to provide for us in all our needs, according to His timing and choice? During times we have prayed, have you ever asked, did God even hear me? Does he really answer my prayers? Where is God’s answer? Is prayer really as powerful as it’s promised to be in the scriptures, or not? Is my faith just too weak? What does God tell us about prayer and His answers to it? What does he teach us? What are the possible ways God might respond when we pray? Listen for these questions and answers about How God Answers Prayer, below in the one-part MP3 Audio Sermon. WE APOLOGIZE, THIS RECORDING IS DEFECTIVE, AND WE WILL BE SEEKING THE ARCHIVE TO SEE IF WE CAN RESTORE THIS SERMON MP3. IF NOT THEN WE WILL DELETE THIS WEEK. THANK YOU FOR YOUR UNDERSTANDING. How strong is your Faith in Prayer? Do you let your problems, financial worries and things of this life, create fear in you? Or do you create fear in your problems by telling them of the Power in God in overcoming them? Listen for these questions and answers about Gods Remedy for Worry, Anxiety and Fear, below in the 1-part Video or 1-part MP3 Audio Sermon below. Listen for these questions and answers about “The Prayer of Faith”, in the 1-part MP3 Audio Sermon below. Listen for these questions and answers about “Joyful Prayer”, in the 1-part MP3 Audio Sermon below. Is it right to pray for our country? 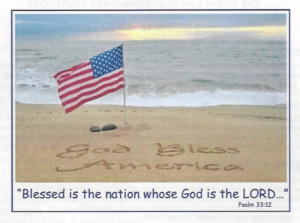 Is it right to pray , God Bless America? 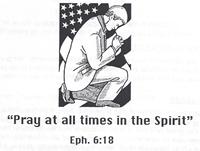 Is it right to pray to God for His divine hand on our nation? Is it right to pray for our Leaders? Are we required to obey God’s law over Man’s law ever? What did God tell the people of Israel in the book of Jeremiah when captured, taken over and exiled to Babylon? What did God tell to Lot, when God was getting ready to destroy Sodom and Gomorrah? How has in recent days when we moved “In God We Trust” to the edge of our coins, Bible out of classrooms, prayer out of our schools, Islam prayer allowed in schools, 10 commandments out of our court houses, how has this turned America back from the Christian heritage of it forefathers? What is Spiritual Warfare? Where is it spoken about in the New Testament and how do we protect ourselves? How is Prayer a part of our Spiritual Warfare Armament? Listen for these questions and answers about AIR SUPERIORITY – (Prayer for America,- the election) , in the one-part MP3 Audio Sermon below.